Citation Information: JCI Insight. 2019;4(2):e125325. https://doi.org/10.1172/jci.insight.125325. Osteoarthritis (OA) is a leading cause of disability, globally. Despite an emerging role for synovial inflammation in OA pathogenesis, attempts to target inflammation therapeutically have had limited success. A better understanding of the cellular and molecular processes occurring in the OA synovium is needed to develop novel therapeutics. We investigated macrophage phenotype and gene expression in synovial tissue of OA and inflammatory-arthritis (IA) patients. Compared with IA, OA synovial tissue contained higher but variable proportions of macrophages (P < 0.001). These macrophages exhibited an activated phenotype, expressing folate receptor-2 and CD86, and displayed high phagocytic capacity. RNA sequencing of synovial macrophages revealed 2 OA subgroups. Inflammatory-like OA (iOA) macrophages are closely aligned to IA macrophages and are characterized by a cell proliferation signature. In contrast, classical OA (cOA) macrophages display cartilage remodeling features. Supporting these findings, when compared with cOA, iOA synovial tissue contained higher proportions of macrophages (P < 0.01), expressing higher levels of the proliferation marker Ki67 (P < 0.01). These data provide new insight into the heterogeneity of OA synovial tissue and suggest distinct roles of macrophages in pathogenesis. Our findings could lead to the stratification of OA patients for suitable disease-modifying treatments and the identification of novel therapeutic targets. Characterization of synovial tissue cellular content in arthritis patients. Synovial tissue from OA total knee replacement and IA ultrasound guided biopsy was digested using optimized protocol. (A) Flow cytometry identification of synovial tissue HLA-DR+CD14+ macrophages (T1), CD4+ T cells (T2), CD14+ monocytes (T3), and DCs (T4). (B) Cytospin morphological assessment of synovial tissue cell subsets. Scale bar: 20 μm. Images are representative of 5 individual experiments. (C) tSNE analysis of flow cytometry data for OA synovial tissue mononuclear cells. 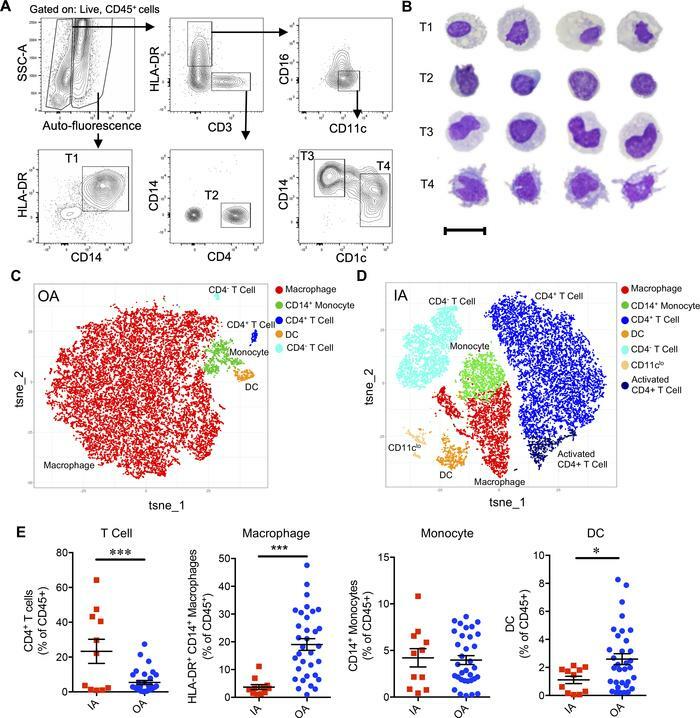 Cell clusters were determined by both featurePlots and conventional flow cytometry gating on tSNE-analyzed FCS files; macrophage, T cell, monocyte, and DC clusters were determined, as indicated in Table 1. (D) tSNE analysis of flow cytometry data for IA synovial tissue mononuclear cells. Cell clusters were determined by both featurePlots and conventional flow cytometry gating on tSNE-analyzed FCS files; macrophage, T cell, monocyte, and DC clusters were determined as indicated in Table 1; CD11clo cluster was determined by low expression of CD11c on HLA-DR+ population; activated CD4+ T cell cluster was determined by expression of HLA-DR by CD4+ T cells. (E) Enumeration of OA and IA synovial tissue cell subsets as a percentage of total CD45+ cells. T cell, n = 32; macrophage, n = 45; monocyte, n = 45; DC, n = 45. *P ≤ 0.05, ***P ≤ 0.001 by 2-tailed unpaired t test.